Menu Description: "Crisp Oriental greens topped with chunks of crunchy Chicken Fingers, toasted almonds and crispy rice noodles tossed in a light Oriental vinaigrette." Applebee's 60-item menu is revised twice a year. That means about 40 percent of the entire menu changes on a regular basis. The other 60 percent are items that are found on menus in all of the Applebee's restaurants, and seldom ever change. One item that has been on the menu for some time now is this Oriental Chicken salad, which is considered one of the restaurants signature items. The recipe makes one dinner-size salad and can be easily doubled or quadrupled for additional servings. This recipe comes from the third book, Top Secret Restaurant Recipes, but the dressing has been improved to more closely match the current dressing served at the restaurant. 1. Blend together all ingredients for dressing in a small bowl with an electric mixer. Put dressing in refrigerator to chill while you prepare the salad. 2. Preheat oil in deep fryer or deep pan over medium heat. You want the temperature of the oil to be around 350 degrees F.
4. In another bowl, combine flour with corn flake crumbs, salt and pepper. 5. Cut chicken breast into 4 or 5 long strips. Dip each strip of chicken first into egg mixture then into the flour mixture, coating each piece completely. 6. Fry each chicken finger for 5 minutes or until coating has darkened to brown. 7. Prepare the salad by tossing the chopped romaine with the chopped red cabbage, Napa cabbage, and carrots. 8. Sprinkle green onion on top of the lettuce. 9. Toast almonds in a small skillet over medium heat for 3 to 4 minutes, or until light brown. 10. 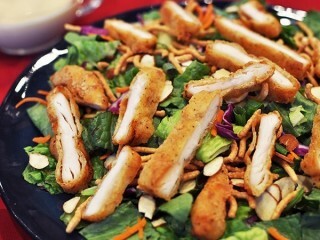 Sprinkle toasted almonds over the salad, then add the chow mein noodles. 11. Cut the chicken into small bite-size chunks. Place the chicken onto the salad forming a pile in the middle. Serve with salad dressing on the side. This dressing is outstanding!! loved it.